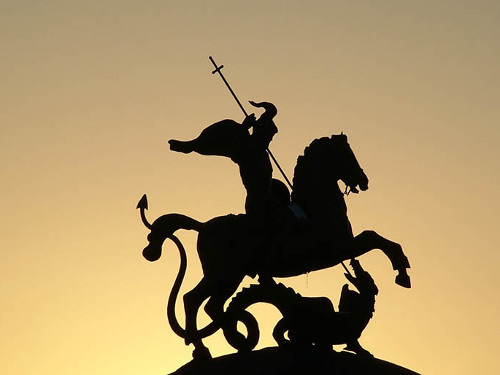 On May 6, the Orthodox Church celebrates St. George the Victory Day. This holiday has acquired a special significance in Russia — St. George seated on a horse is captured on coins and in the center of the Russian coat of arms. What is so famous St. George? The great martyr lived at the end of the 2nd — beginning of the 3rd century in the Roman Empire in a family of Christians. Due to his perseverance and courage, he entered the military service and earned the title of commander. Being a true Christian, George did not renounce his faith when the emperor Diocletian invited him to retreat from Christianity. He died in suffering for his faith and began to read as a vivid example of valor and steadfastness. About the miracles that George the Victorious worked, and about his brave deeds were legends. One of them served as the plot of the picture, in which the saint is depicted on a horse and with a defeated monster. According to legend, in Beirut, in the lake, he settled a huge snake, which did not give rest to the locals. In order to somehow cajole the snake, the inhabitants were forced to give him a child every day. St. George the Victorious was able to hit the serpent with a spear and save people from suffering. It was this story of the victory of the holy warrior that became the symbol of the triumph of good over evil. In the people this holiday is called Yegoryev day. According to legend, on this day Yegor Veshny opens the spring earth with his keys and releases dew, which is why the growth of grass begins. In folk tales, Yegor is considered the patron saint of cattle. That is why on this day, May 6, the peasants for the first time after the winter drove out livestock to the meadow. This day was celebrated on a special scale, because the warmest time began. In Yegoryev, the day began the first work in the field. Already later, with the adoption of Christianity, the fields on this day were sprinkled with holy water, and the priests read a prayer for a rich harvest. According to signs in Yegoryev, the day was judged about the weather for the future. The dew had a special power on this holiday. It is believed that if you go barefoot through the Egoryev dew in the morning, then no illnesses will take you all year. It rains on Yegoria — good offspring of cattle will be born. Warmly in Egoryev day — wait for the soon summer. On this day, swallows fly in and nightingales start singing. Particular attention was paid to the cuckoo singing. It is believed that if this bird is consuming, then the cattle will fall.